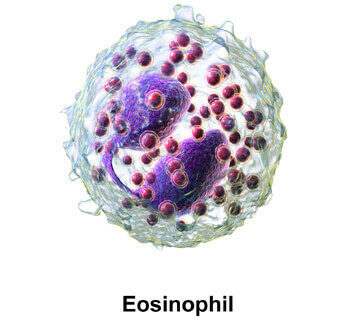 Eosinophils are derived from colony-forming unit–eosinophil (CFU-Eo), a progenitor that differentiates into an eosinophilic myeloblast, promyelocyte, myelocyte, and finally a mature eosinophil. Eosinophils constitute 2% to 5% of circulating leukocytes in normal individuals and are readily recognized from their prominent cytoplasmic granules, which contain toxic molecules and enzymes that are particularly active against helminths and other parasites. GM-CSF and IL-3 promote eosinophil growth and differentiation. The production of eosinophils from the bone marrow and the survival of eosinophils in peripheral tissues are enhanced by the cytokine IL-5, which maintains the viability of eosinophils through inhibition of apoptosis. Eosinophils are prominent cells in most allergic responses. Eosinophils possess several surface markers and receptors involved in differentiation, recruitment into tissues, activation, synthesis, and release of their multiple mediators. Receptors for immunoglobulins include those for immunoglobulins G, E, and A (IgG, IgE, IgA). Eosinophils have receptors for complement components that include C1q (CR1), C3b/C4b (CR1), iC3b (CR3), C3a, and C5a. Both C3a and C5a are eosinophil chemoattractants that stimulate production of oxygen radicals by eosinophils, which potentially express several receptors for chemokines. CCR1 is a receptor for macrophage inflammatory protein 1α, monocyte chemotactic protein 3, and the chemokine regulated on activation, normal T-cell expressed and secreted (RANTES); CCR3 is a receptor for eotaxin, eotaxin-2, eotaxin-3, monocyte chemotactic protein 3, and RANTES. Mature eosinophils, like their immature precursors, express functional heterodimeric receptors for the three cytokines— GM-CSF, IL-3, and IL-5—that promote eosinophilopoiesis and stimulate the functioning of mature eosinophils. The eosinophil’s cationic granule proteins include major basic protein (MBP), eosinophil peroxidase (EPO), eosinophil cationic protein (ECP), and eosinophil-derived neurotoxin. Another prominent protein of the eosinophil is the Charcot- Leyden crystal protein, which constitutes an estimated 7% to 10% of total cellular protein, possesses lysophospholipase activity, and forms the distinctive hexagonal bipyramidal crystals that are the hallmark of eosinophil-associated inflammation. MBP is a potent cytotoxin and helminth toxin in vitro. It can kill bacteria and many types of normal and neoplastic mammalian cells, stimulate histamine release from basophils and mast cells, activate neutrophils and platelets, and augment superoxide generation by alveolar macrophages. It can also induce bronchoconstriction and transient airway hyperreactivity when instilled into the monkey trachea. ECP, like MBP, has marked toxicity for helminth parasites, blood hemoflagellates, bacteria, and mammalian cells and tissues and has been shown in several studies to produce respiratory epithelial damage similar to that seen in severe asthma. As with MBP and ECP, EPO is highly cationic and exerts some cytotoxic effects on parasites and mammalian cells in the absence of hydrogen peroxide. However, EPO is highly effective in combination with hydrogen peroxide and a halide cofactor (iodide, bromide, or chloride), from which EPO catalyzes the production of the toxic hypohalous acid. In the presence of these compounds, EPO is highly toxic to various unicellular, multicellular, and other targets that include viruses, mycoplasma and other bacteria, fungi, and parasites. Eosinophil-derived neurotoxin is a poor cationic toxin with only limited toxicity for helminths and mammalian cells, but it induces significant neurologic damage when injected intrathecally or intracerebrally into rabbits or guinea pigs. In allergic conditions, eosinophils may play a dual role. They can suppress the local tissue response to inflammatory mediators involved in IgE-mediated hypersensitivity reactions by inactivating histamine, platelet-activating factor, and heparin. On the other hand, eosinophils can augment destruction through the toxic effects of the products they release upon degranulation. The balance between these two seemingly contradictory functions of eosinophils in IgE-mediated reactions is still under investigation.